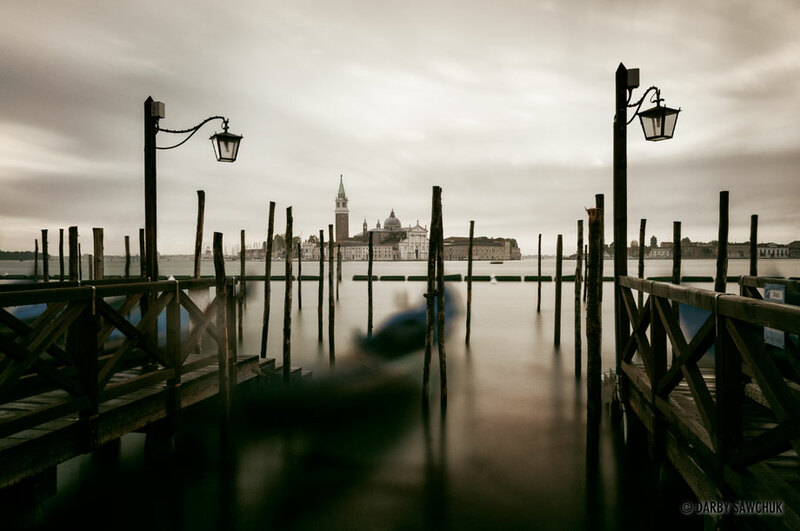 Dreamy Venice is like nowhere else. It’s as though a city from another world fell from the sky and landed in the lagoon. It’s difficult to imagine how else such a place could exist. In truth, the dozens of tiny islands were inhabited by refugees hoping to escape foreign invasions. 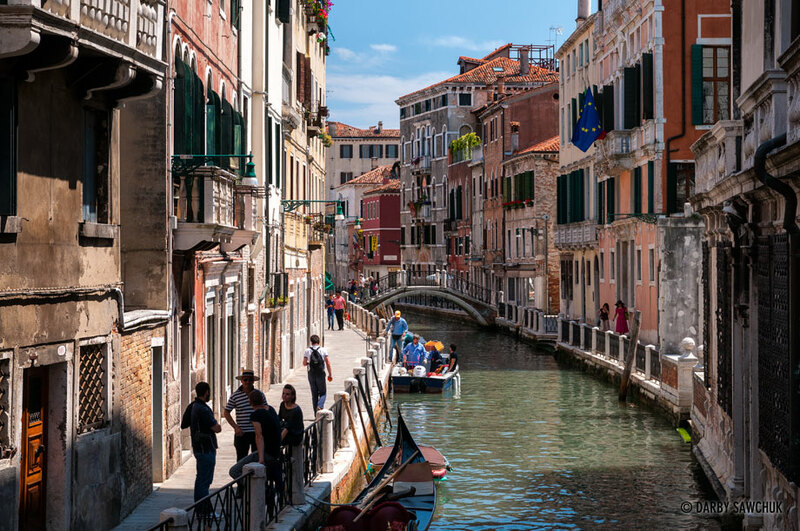 The irony of today’s tourist hordes overwhelming Venice is an obvious one, but it’s easy to forget about the cruise ships’ masses when there are so many magical sights to behold. 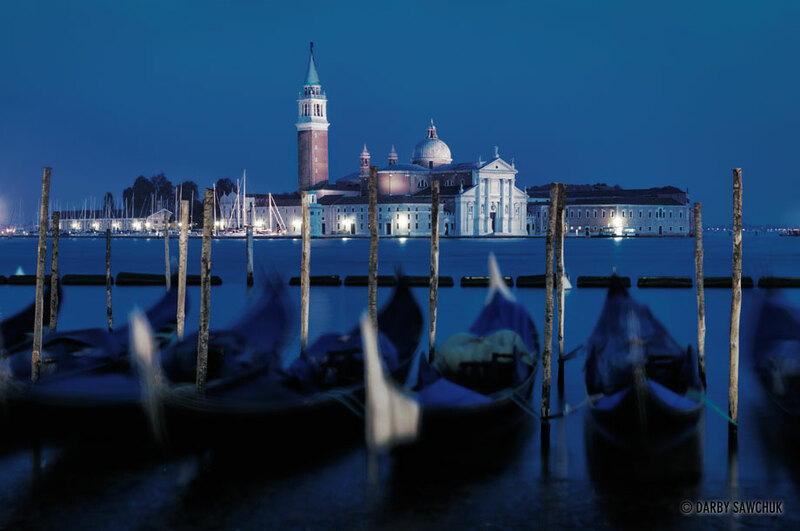 Echoes of singing gondoliers, mirror reflections in calm canals, and sunsets over historic buildings floating on water are all enough to set even the most calloused heart into romantic flutters. For images from elsewhere in the Venetian Lagoon, please check out my photos of Burano, Italy. 02. 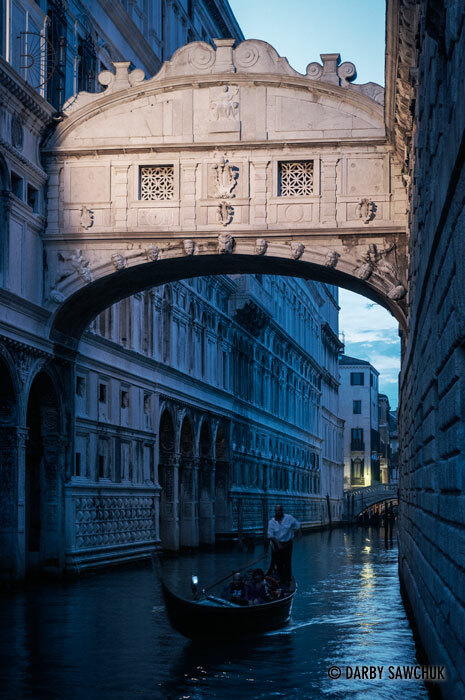 A gondola glides through the canal beneath the Bridge of Sighs in Venice, Italy. 03. 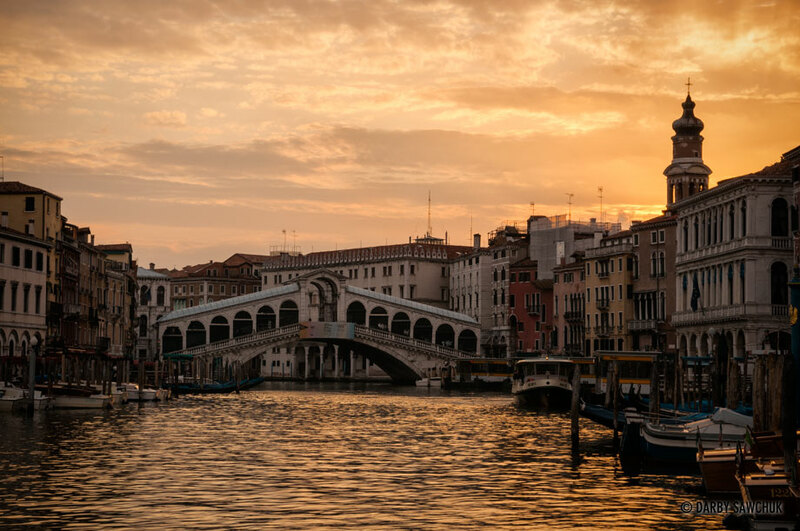 The Rialto Bridge and the Grand Canal at sunrise in Venice, Italy. 04. 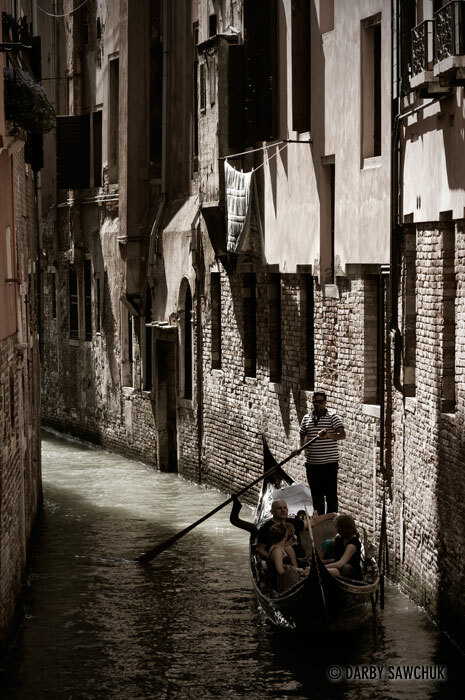 A gondolier pushes his passengers through one of the small canals of Venice Italy. 05. Gondolas bob in the water between the Dorsoduro and San Marco districts of Venice. 06. 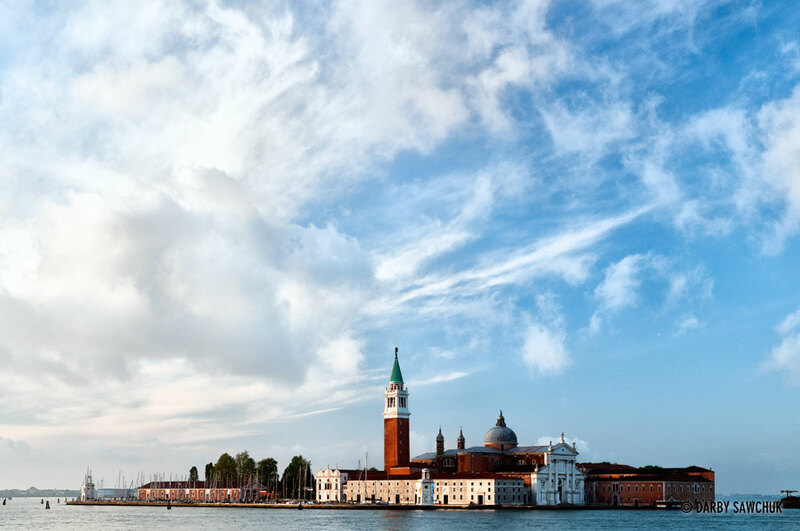 The Island of San Giorgio Maggiore in Venice, Italy. 07. 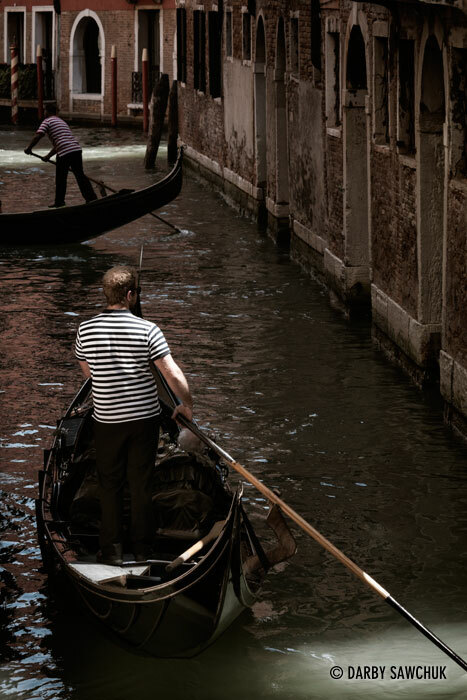 A gondolier rows through the small canals of the San Marco district of Venice, Italy. 08. 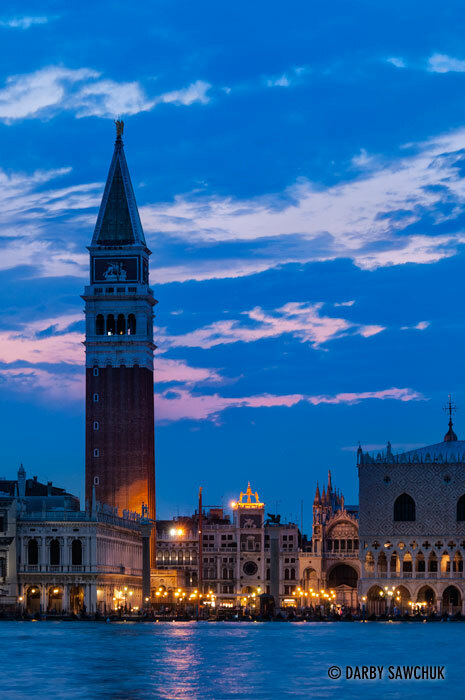 Piazza San Marco in Venice at dawn with the Doge’s Palace on the left and Isola San Giorgio Maggiore in the distance on the right. 09. 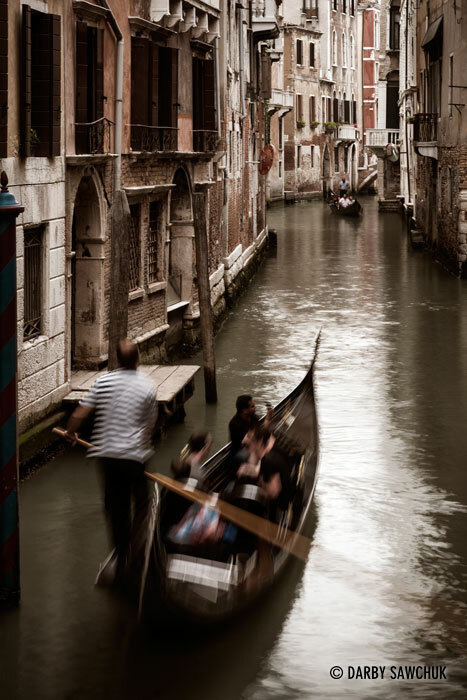 Gondoliers carry passengers through the small canals of Venice, Italy. 10. 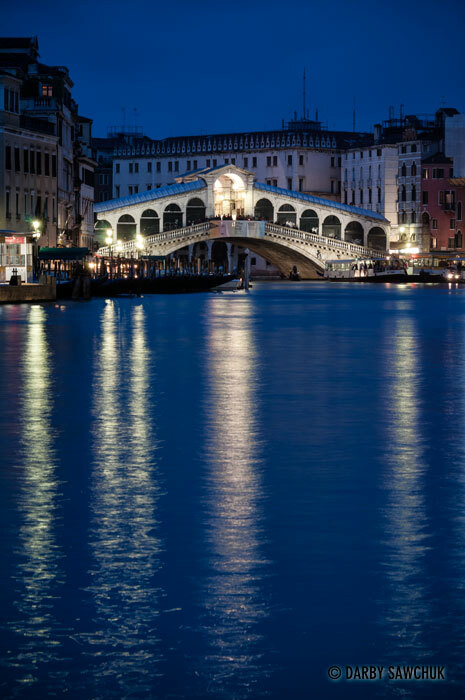 The Rialto Bridge spanning the Grand Canal lit up at dusk in Venice. 11. 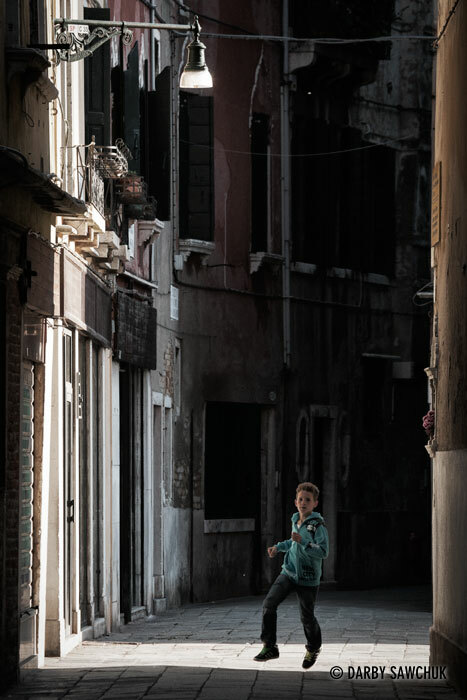 A boy runs through the streets of Venice in the San Polo district. 12. 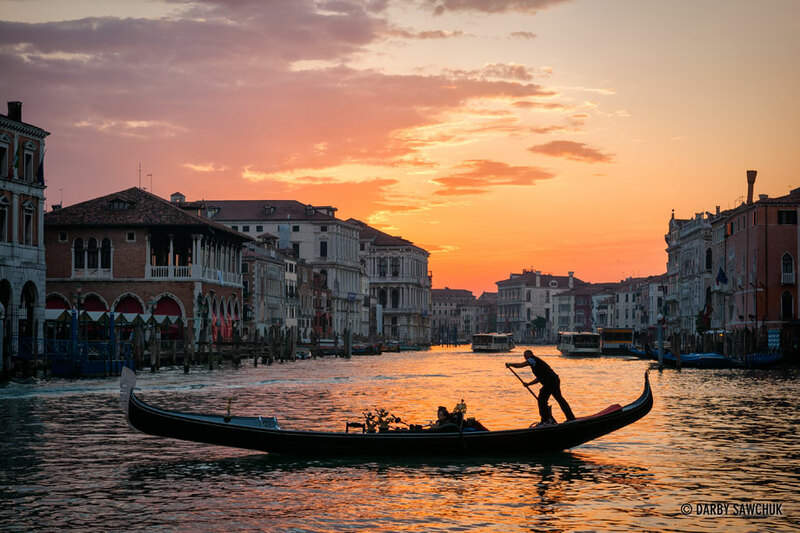 A gondola crosses Venice’s Grand Canal at sunset. 13. 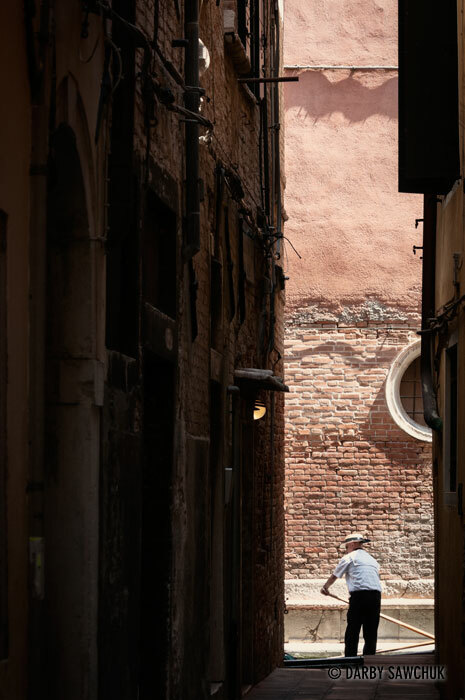 A convergence of alleys and streets in the San Croce district in Venice. 15. 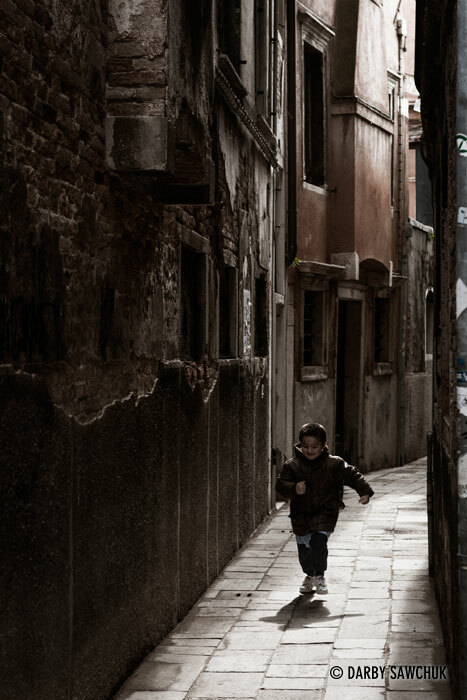 A young boy runs through a narrow street in the Castello district in Venice, Italy. 16. 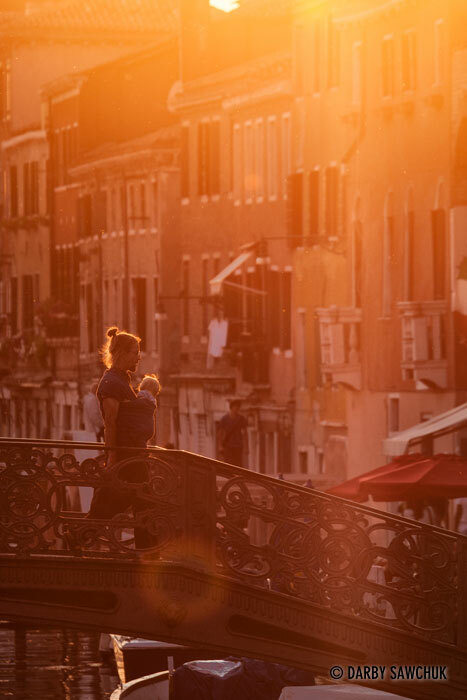 A man carries a baby across a bridge in the Cannaregio district at sunset. 17. 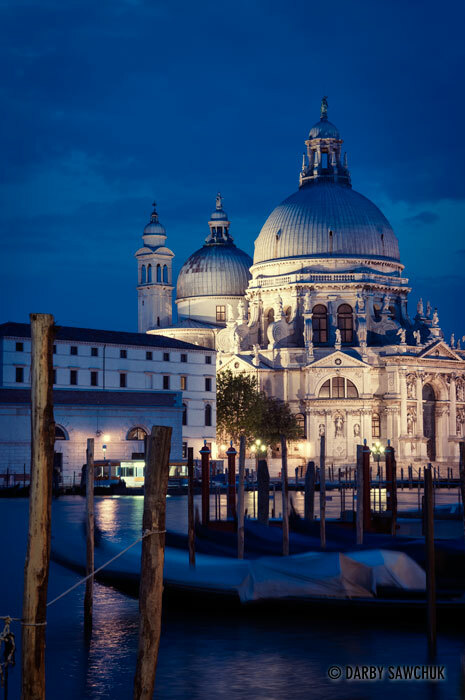 The Church of Santa Maria della Salute from across the Grand Canal at night in Venice. 18. Gondolas bob in the water near St. Mark’s Square looking across to Isola San Giorgio Maggiore and Giudecca. 19. A gondola on the Grand Canal. 20. 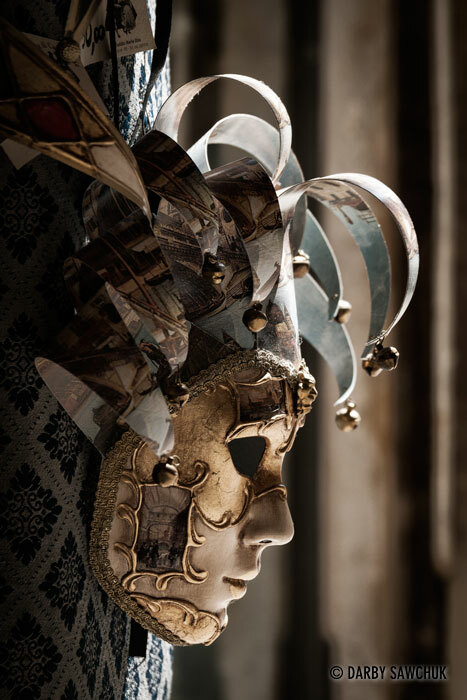 A Venetian carnival mask. 21. 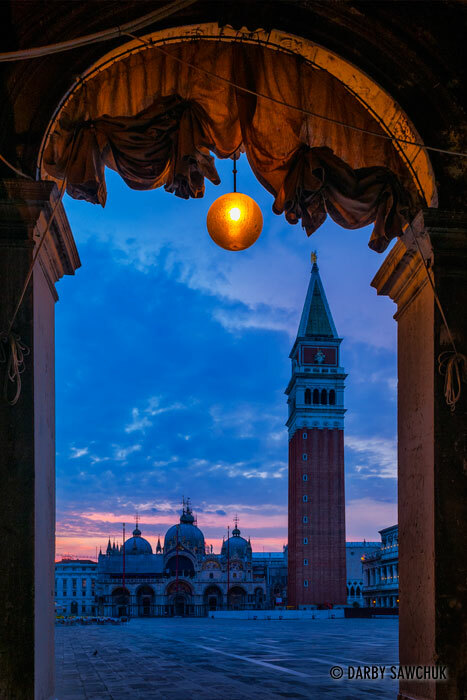 St. Mark’s Campanile rises over St. Mark’s Square at dusk in Venice, Italy. 22. 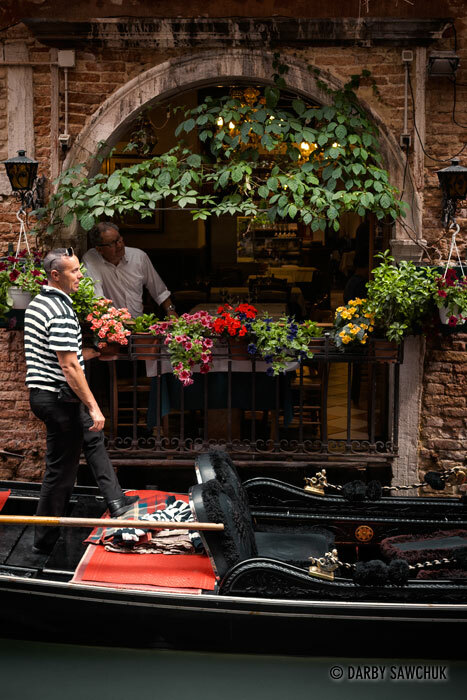 A gondolier talks with a friend at a restaurant open to one of Venice’s small canals. 23. 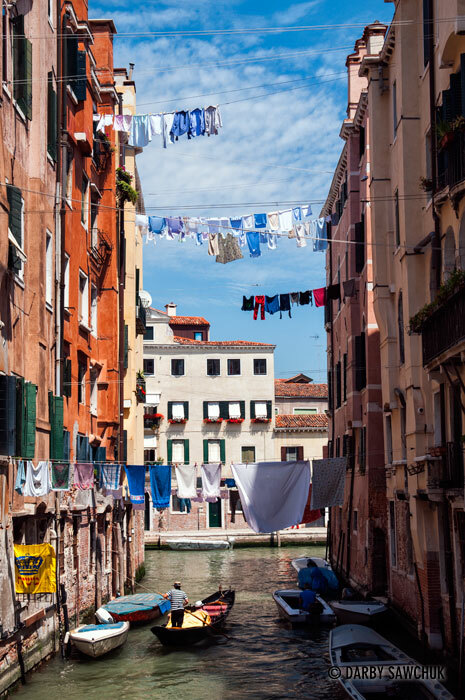 Laundry is strung between buildings over a canal in the Jewish Ghetto of Venice. 24. 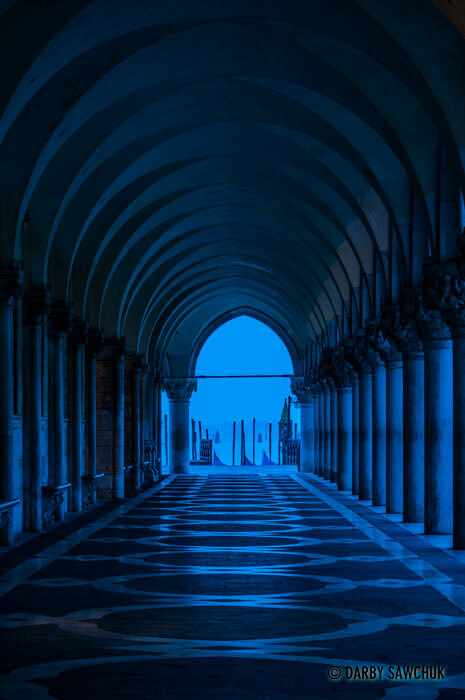 The blue light before dawn filters through the columns supporting the arcade beneath the Doge’s Palace in St. Mark’s Square. 25. 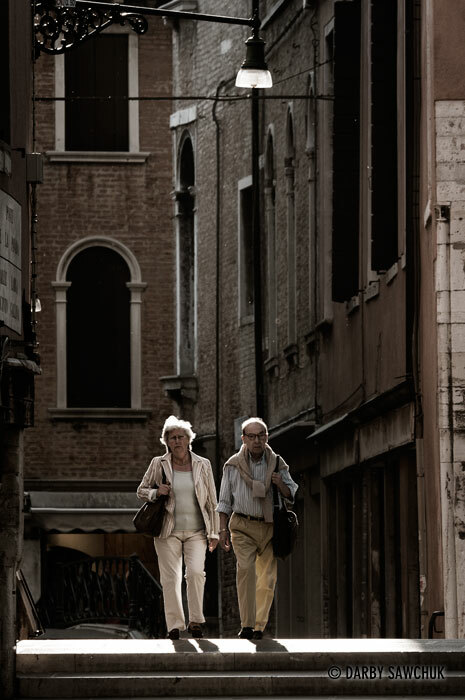 A couple walk over a bridge in the Cannareggio district in Venice, Italy. 26. 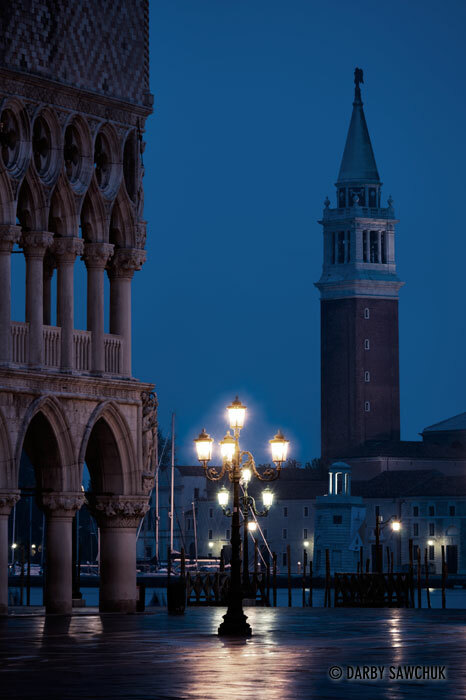 Piazza San Marco before dawn in Venice. 30. 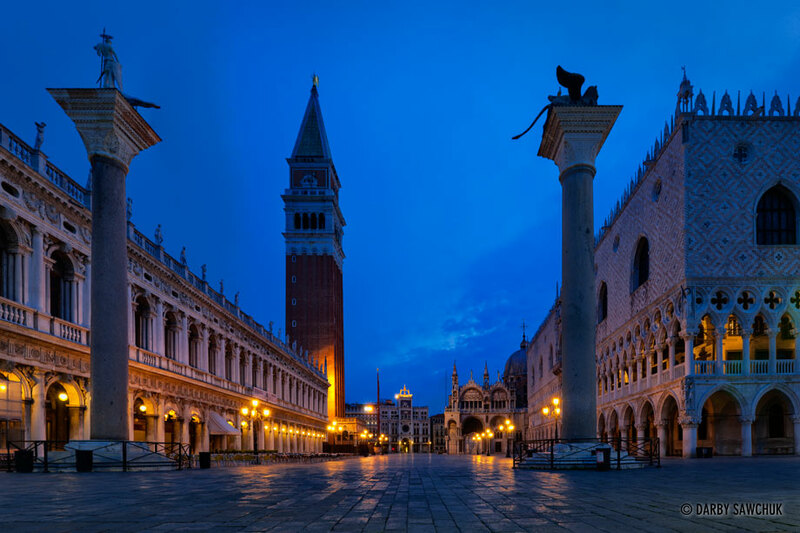 St. Mark’s Square, St. Mark’s Basilica and Campanile at dawn. 31. 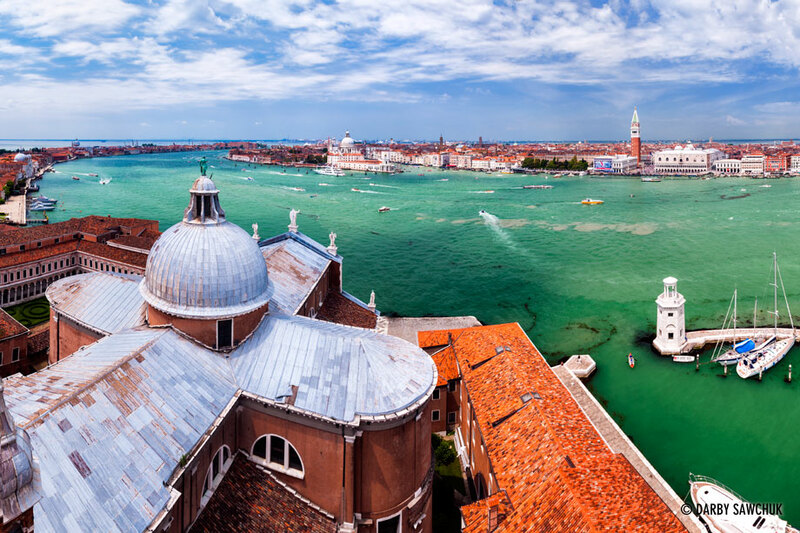 The view of Venice from the campanile of Chiesa San Giorgio Maggiore. 32. 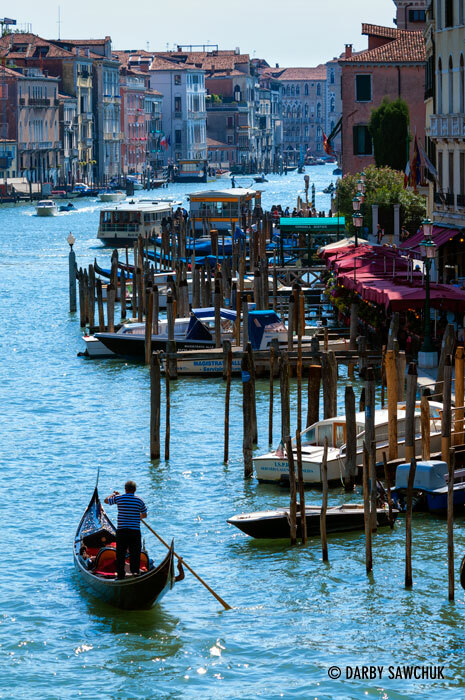 A panoramic view of the Grand Canal from the Rialto Bridge in Venice, Italy. 33. 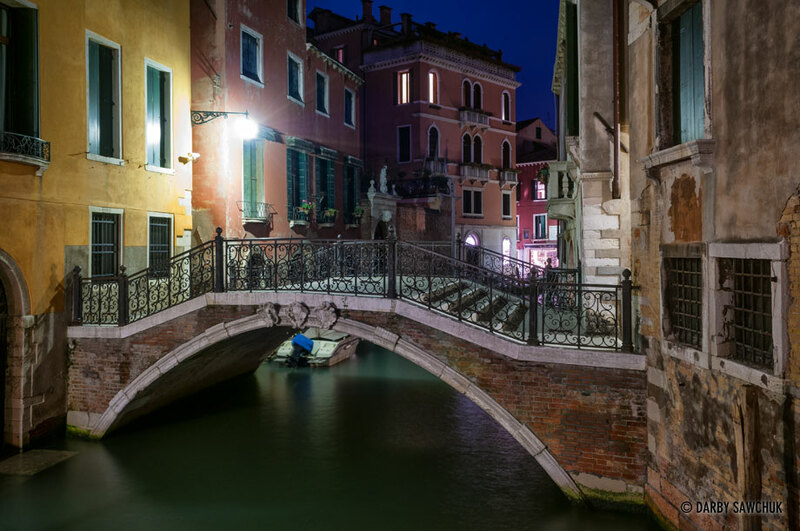 One of the small canals in the Cannaregio district of Venice. 34. 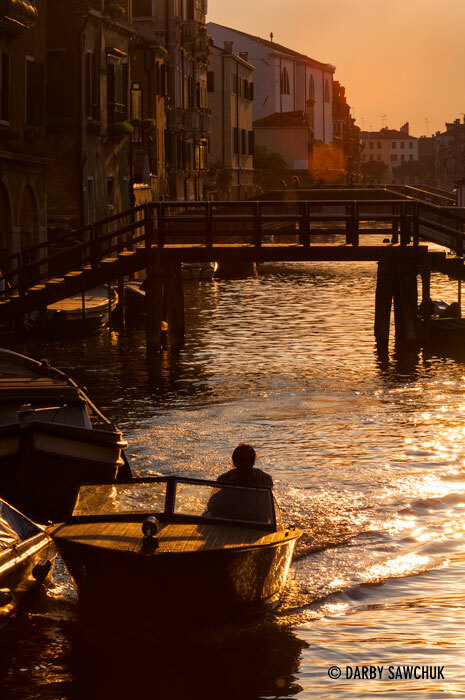 A boat travels at sunset through the canals of Venice in the Cannaregio district. 35. 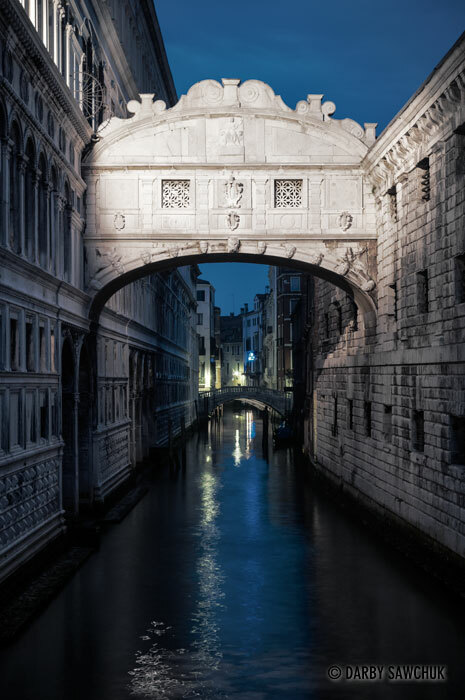 The Bridge of Sighs in the evening in Venice. 36. 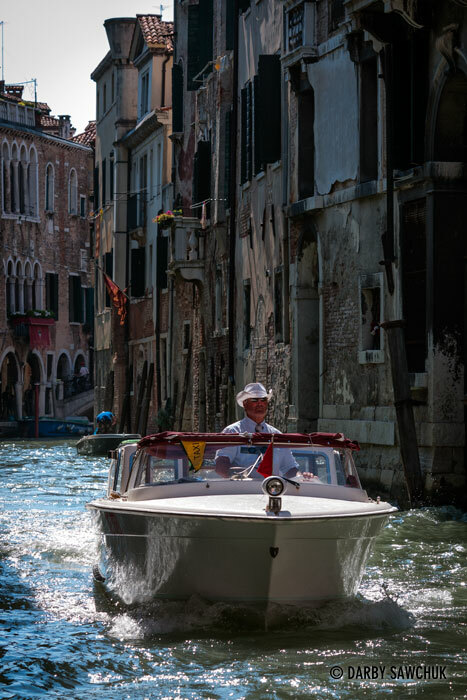 A man steers a motorboat through the small canals of Venice. 37. Gondolas bob in the water near St. Mark’s Square looking across to Isola San Giorgio Maggiore and Giudecca. 38. 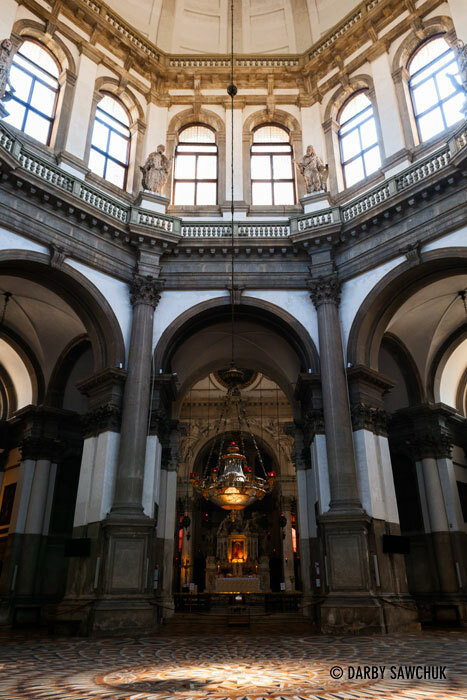 The interior of the Santa Maria della Salute church in the Dorsoduro district of Venice. 39. 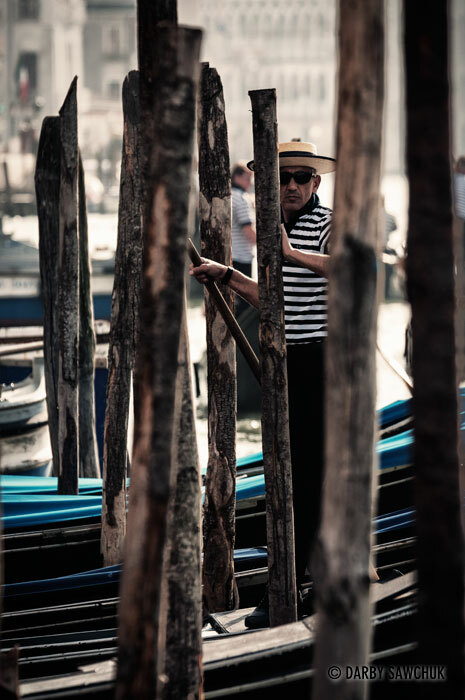 A gondolier waits on his boat for new passengers in Venice. 40. 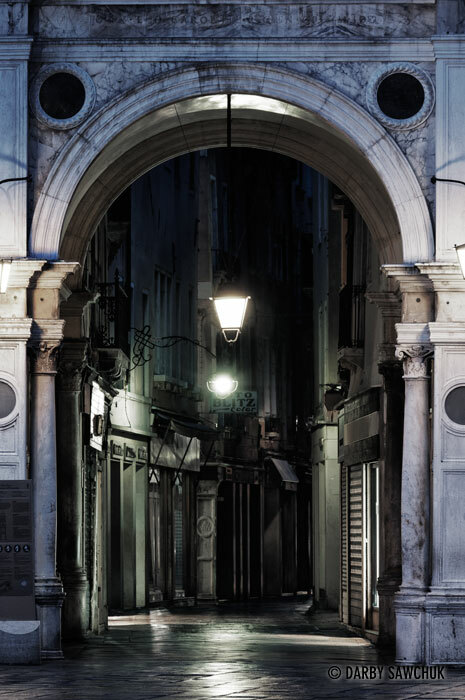 An archway leads to a narrow alley off St. Mark’s Square. 42. 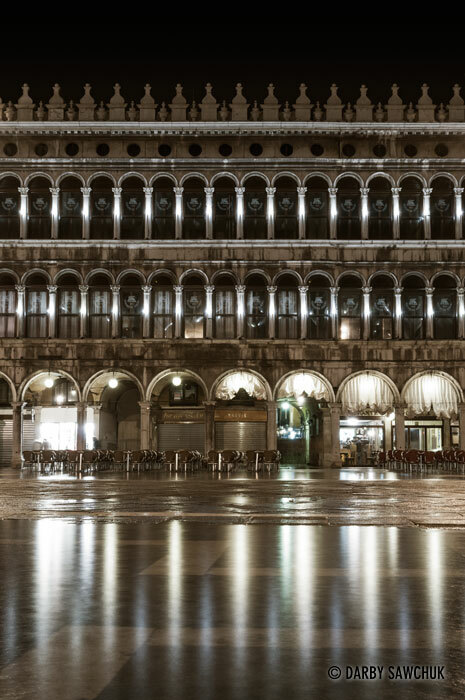 Rising water floods St. Mark’s Square in Venice, Italy. 43. 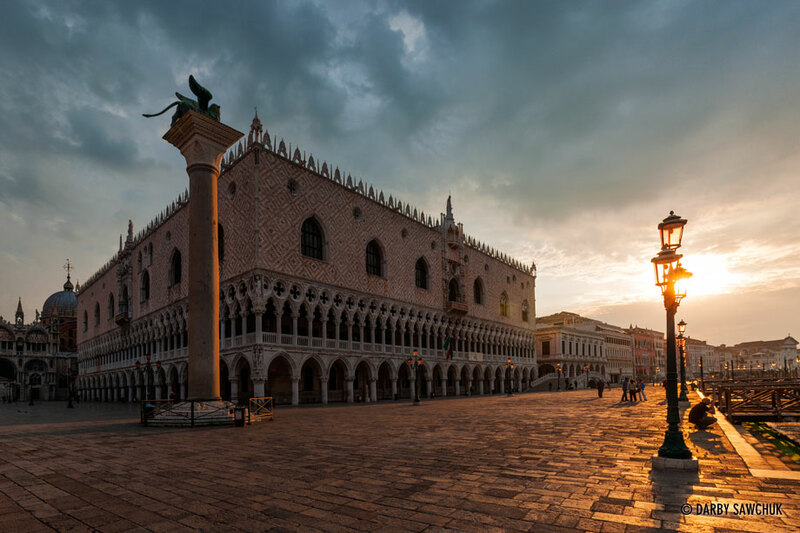 The sun rises over the Doge’s Palace in Venice. 44. 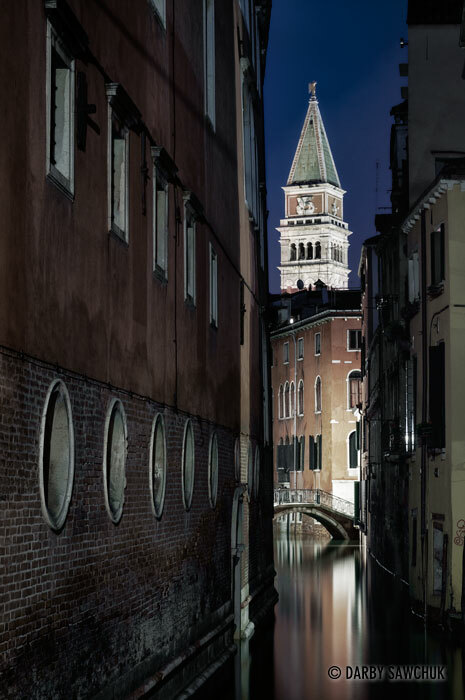 St. Mark’s Campanile rises over one of the small canals in the San Marco district at night. 45. Gondoliers steer gondolas through the small canals of Venice. 46. 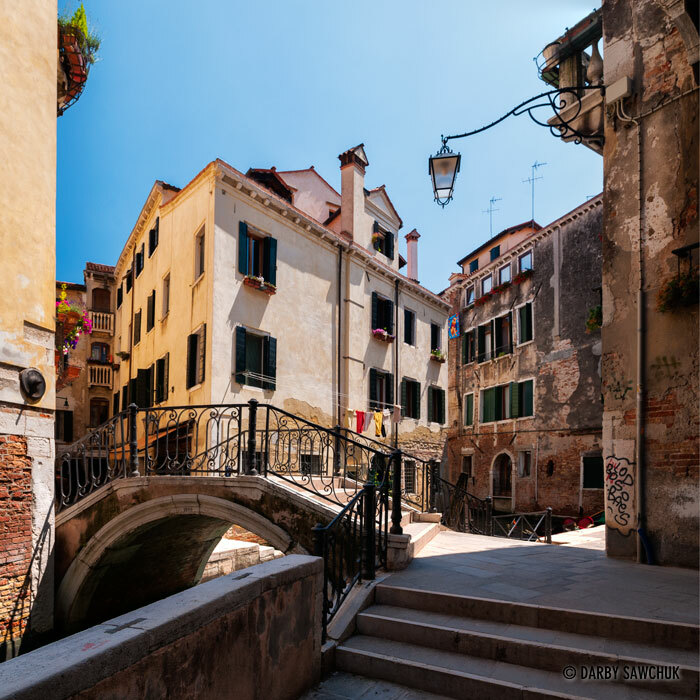 Rio Marin in the San Croce district of Venice. 47. 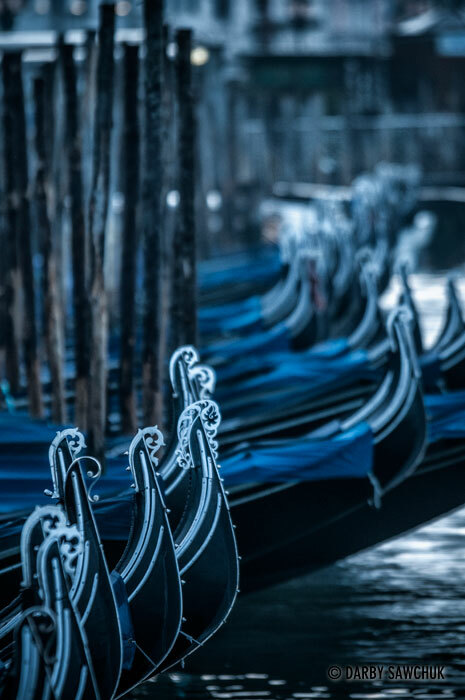 Gondolas lined up near St. Mark’s Square. 48. 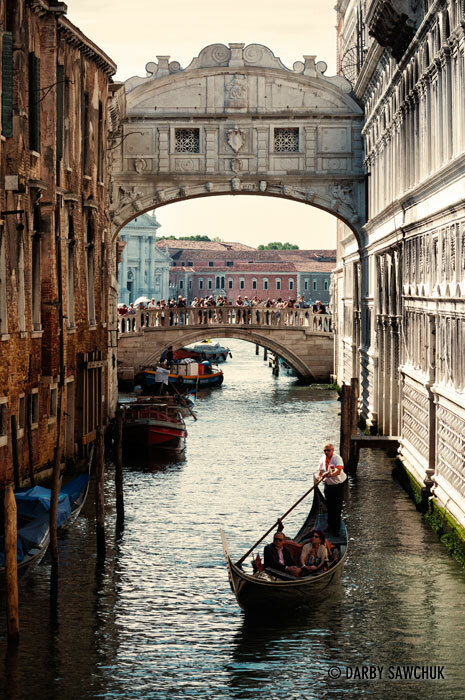 A gondola glides under the Bridge of Sighs while tourists admire the view in the background. 50. 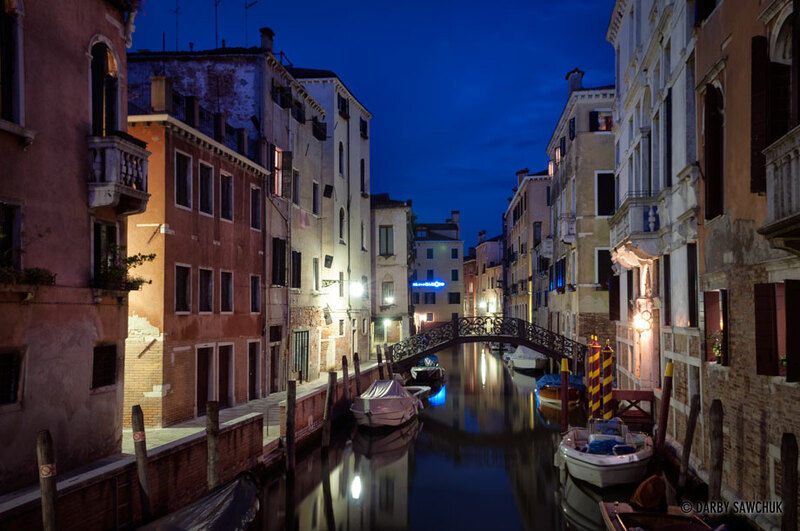 One of the small canals in the Castello District of Venice, Italy. 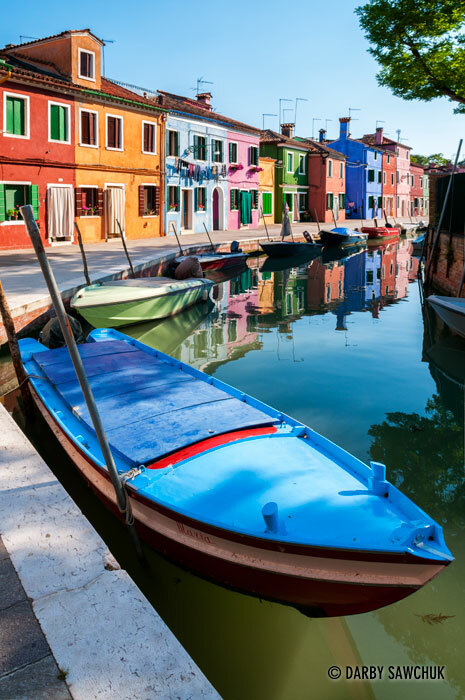 51.The colourful houses of Burano, a small island north of Venice. To see more, please visit my gallery of photos of Burano. 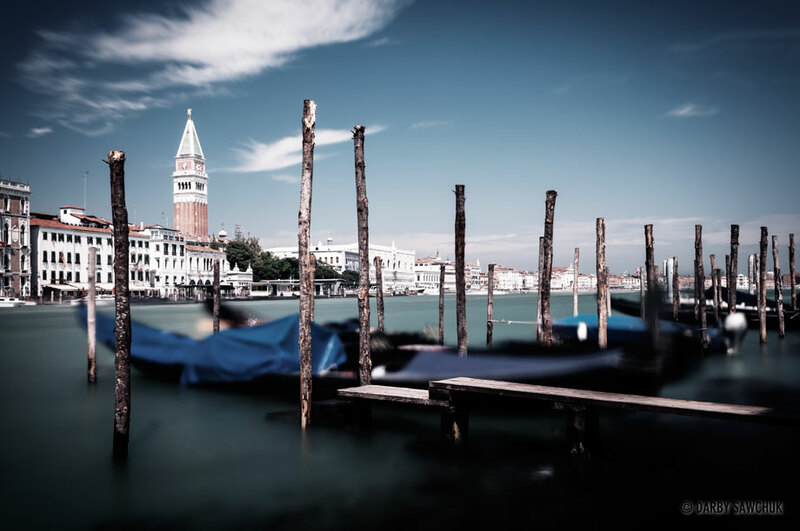 Keywords: photos of venice, images of venice, pictures of venice, photos of canals, landscape photography, travel photography, cityscape photography architectural photography, venetian, italy, italian, fine art prints, stock photography. Wonderful pictures. You´re very talented. Thanks a lot for sharing.